Editor’s note: This information was reported too late to the Tribune Eagle to make the Saturday print edition. CHEYENNE — The Pine Bluffs volleyball team picked up a tight 25-23, 21-25, 25-22, 31-29 win at Saratoga on Friday afternoon. “I was very impressed with the determination of this team. 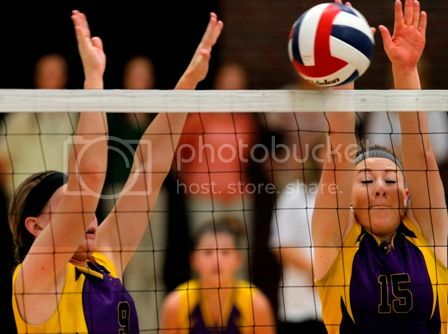 We fought hard and never gave up,” Pine Bluffs coach Christina Nusbaum said via email. Jesi Zitek finished the game with 22 digs, six assists and two aces while Brooke Darden had 16 assists, 16 digs and one ace. Andrea Baker had 12 kills, 12 digs and three aces. Dana Mullins finished with 11 digs and two aces. PINE BLUFFS — There is one blemish on an otherwise perfect season for the Pine Bluffs volleyball team — a five-set loss to Guernsey. Saturday’s shot at redemption? Well, that was just what the Lady Hornets needed. In the regular season finale, in front of the home fans on senior night, Pine Bluffs got a chance to avenge its only loss and it didn’t waste the opportunity. The team won in four sets, rallying back from a first set loss. What did it mean? Everything. “It means a lot to us. It means we have improved from the beginning and it feels like we’re undefeated now because we beat the only team that beat us. It feels really good that we are the top dogs and watch out,” senior Cassidy Smith said.